According to one of my favorite culinary school chefs, there are four tastes that should be very distinct if it’s in the dish’s title. Those four are lemon, cinnamon, mint, and coffee. If one of those words is in the title, you better taste it! There is quite a bit of lemon zest and fresh lemon juice in this dish for that reason. It adds a pop to the taste buds and really makes the dish memorable. Do me a favor and skip the bottled lemon juice, it is a sin among professional chefs and does not leave the same refreshing lemon taste on the palate as fresh lemons do. Put a large pot of lightly salted water on the stove to boil the pasta. Cook the pasta to al dente according to package directions. Heat a large saute pan on medium heat. Add the oil, onion, garlic, and lemon zest to the pan and cook for 5-7 minutes so that the onions caramelize. Stir with a wooden spoon throughout to keep from burning. Add the white wine to deglaze the pan. Cook for a minute or so and add the chicken stock and asparagus. Cut the lemons in half and add the juice to the pan by squeezing over a strainer to catch the seeds. Cook for 4-5 minutes, or until the asparagus begins to soften. Reserve 1 cup of the pasta water before draining. Add the pasta back into the stock pot with the onion and lemon sauce. Return the pasta to medium heat. 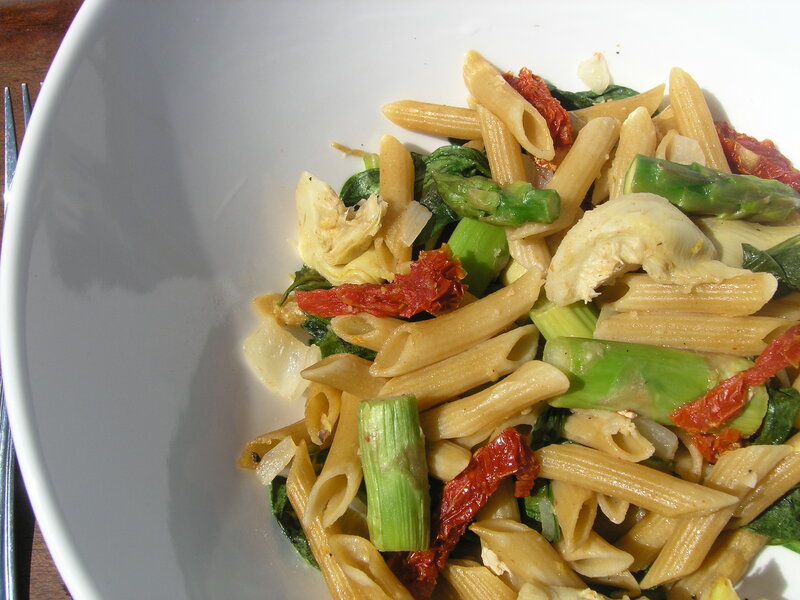 Add the spinach, artichoke hearts, and sun-dried tomatoes to the pasta. Cook covered for 3-4 minutes, or until the spinach begins to wilt. Stir the pasta well to mix all of the ingredients. If it seems a little dry, add in the pasta water 1/4 cup at a time. Season with salt and freshly cracked pepper to serve. Top with shaved Parmesan if desired. Ahhhhhhhh, pasta finally! I am so excited to try this one. I really look forward to your postings! It has been a great inspiration for some new ideas and I have loved the recipes I’ve tried so far (the Haddock, the Fried Rice (minus the shrimp) and the Quinoa recipes. I am planning on trying the Zesty lemon Pasta this week. Keep them coming!! !